The magnificent Winchester Cathedral is the centerpiece of the city, but an aspect of the beautiful cathedral that drew my attention in particular was the pointing hands carved onto an exterior wall in 1633. I had the idea that the carving forms a kind of map in terms of the Winchester manuscript of Malory’s Le Morte Darthur. Returning a year later, sure enough, the carving was as I remembered it, pointing out: (roughly translated) “That way thou who comest to pray. 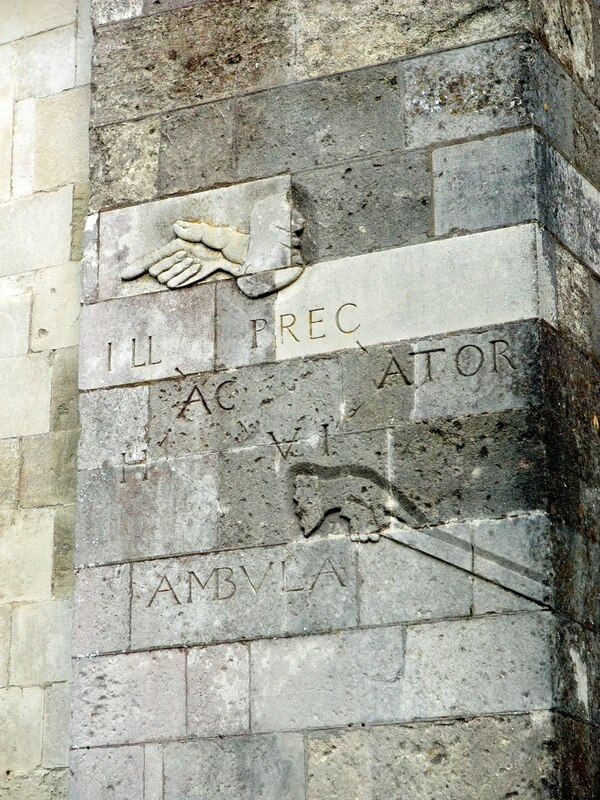 This way thou who are pursuing thy walk.” The story of the manicula is that the bishop at that time wished to instill a more reverent atmosphere in the churchyard, but it is ironic how the grammar “this way” seems to encourage the more secular, ambulatory choice. The pointing hand for those wishing to walk rather than pray–voila!– points in the direction of Winchester College, where the manuscript of Malory’s tale was found in 1934. This worked on my imagination. It is the discovery of the manuscript that brought greater attention to the Roman War campaign episode (I could go on and on about this–oh wait, I did–I wrote my whole dissertation on this topic!) The fact that one of the hands points toward where the manuscript was found, that the manuscript also contains “manicula,” or pointing hands, and that the Roman War campaign is a geographic story–a narrative map–seems to me a kind of geographic synchronicity. So I followed the “map” of the manicula, following centuries of secular walkers and headed in the direction of the historic Winchester College, a boys college preparatory founded in 1382. 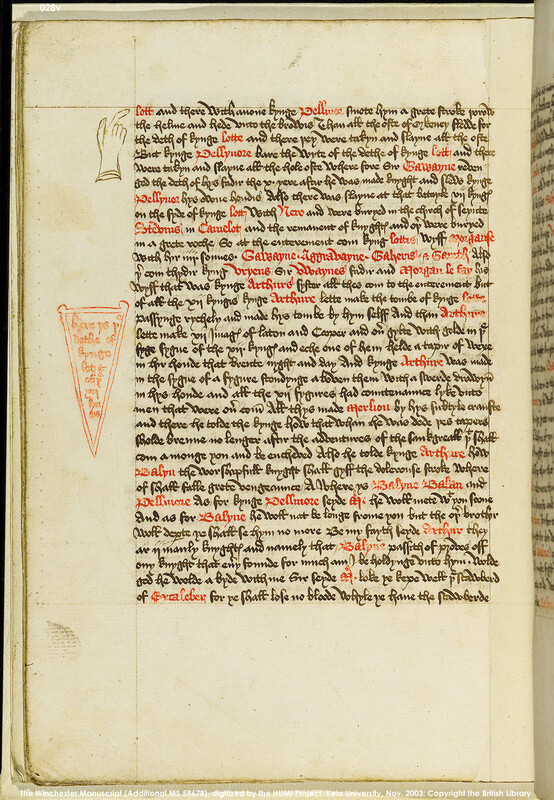 If you are interested in the manicula found in the manuscript, Thomas Crofts book, Malory’s Contemporary Audience, provides an elegiac interpretation of the shields and manicula in the Tale of Balyn. Two of the pages of the manuscipt are shown here. A distinctive feature of the manuscirpt is the way in which the names of the knights and place names are written in red ink. 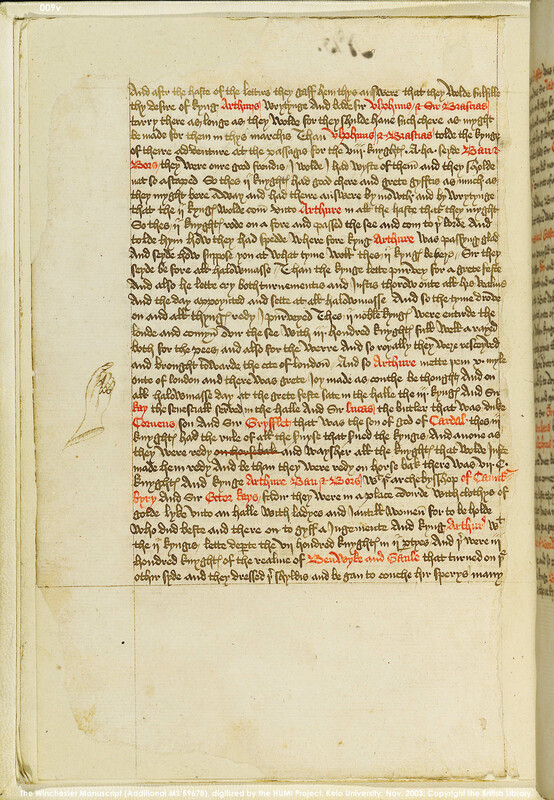 If you look closely, you will see the manicula in the margins of the manuscript. To see a digital facsimile of the whole manuscipt and of the printed book, Takako Cato’s Malory Project is a treasure trove. Walter F. Oakshott, the librarian at Winchester College who discovered the manuscript in the College library in 1934, tells a fasincating and delightful story in his 1963 essay “The Finding of the Manuscript” in Essays on Malory. Gallery | This entry was posted in Uncategorized and tagged King Arthur, manicula, Maory Project, Meg Roland, Roman War, Thomas Malory, Winchester. Bookmark the permalink.